How this pie came about was really simple. 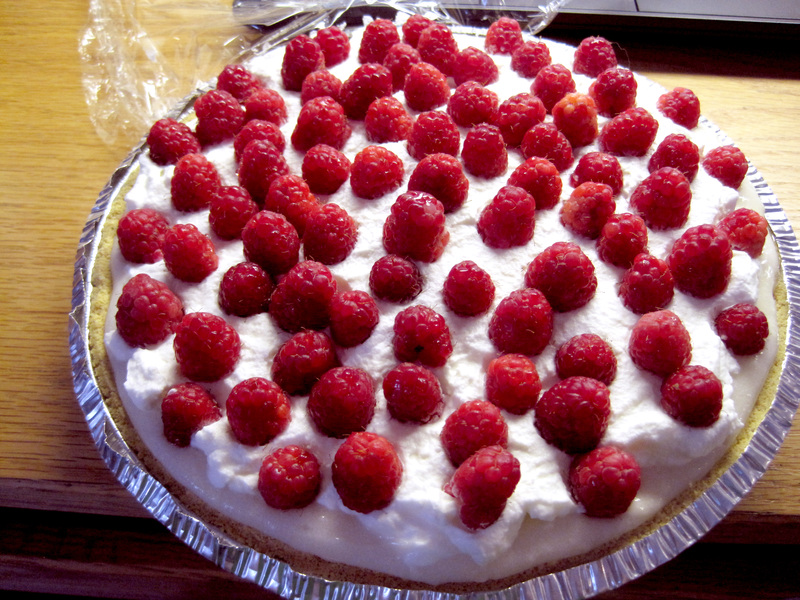 I was looking at my usual roster of baking blogs, and I had left a blog up where there was a link to a “White Chocolate Raspberry Tart.” And that’s how it all began. I didn’t have a pie dish, and coincidentally, pie crusts were on sale at the supermarket so I got one. Surprisingly, acquiring fresh berries isn’t difficult at all in the middle of winter. The recipe that I was inspired by was this one, but I thought the filling was too finicky and too calorific. I don’t have a sieve, I don’t have good white chocolate, I don’t even have a decent crust. I’ll just make something up! And so I did. I bought a box of instant vanilla pudding from Trader Joe’s, and folded in some whipped cream for lightness. Not surprisingly, the pie collapsed on me – which is why there are no pictures of the sliced pie. The pie crust didn’t hold together, and the filling was too gooey. It was quite delicious, though, for a quick fix of the dessert that it is. Make vanilla pudding as instructed on box. Add melted white chocolate to pudding. Add half of whipped cream to mixture and mix. Pour into pie crust. Layer remaining whipped cream onto pie filling. 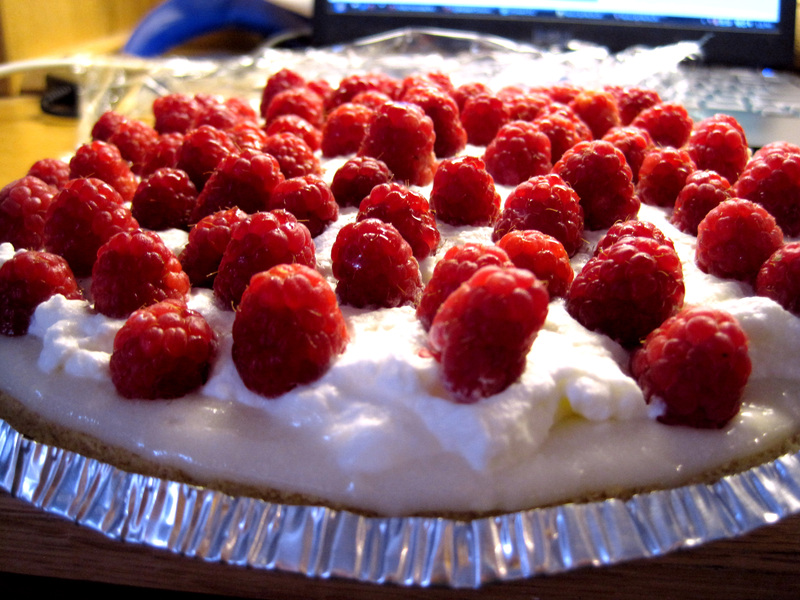 Top pie with raspberries. Chill for at least an hour, or not if you can’t wait. I imagine that this combination would translate easily into a trifle, which is a lot less fussy. For a single serving dessert, just crumble some cookies into the base of a glass and add in vanilla pudding, white chocolate chips and raspberries in layers. I’m sure raspberry jam would go beautifully in the dessert too.